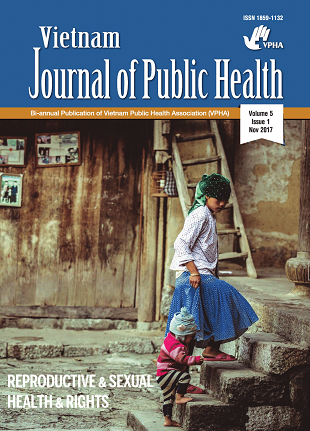 Vietnam Journal of Public Health is the official organ of Vietnam Public Health Association, published under license No. 48 / GP-BVHTT dated May 28, 2004 by the Minister of Culture and Information, No. 531 / GP -BTTTT dated April 24, 2009 by the Minister of Information and Communications, the license amendment No. 296 / GP-MIC date July 29, 2013 by the Minister of Information and Communications and ensure international standards ISSN 1859 - 1132 by National Agency for Science and Technology Information, issued in August 22, 2006. Our VJPH aims to become a prestigious scientific journal in Vietnam and the Asia Pacific in providing reliable and qualified research, interventions and shared experiences in the field of public health in content, professional publishing systems and user-friendly utility for authors and readers. VJPH will try its best to stimulate an increase of scientific research in quantity, quality and sharing in the field of public health through the publication of peer reviewed articles with high scientific value compliance and ethical principles. A national wide program for supporting researchers to improve writing skills and publications will also be integrated. Vietnam Journal of Public Health would like to receive more attention, submission, discussion from the reviewer, authors and readers to be developed in Journal. On behalf of the entire community of Vietnam Journal of Public Health Editorial board members, I would like to thank the attention and welcome of scientists and readers for many years. For the hard work and continuous effort of Journal members, the improvement in the publishing process and the strictly assurance in international publishing guidelines, I believe Vietnam Journal of Public Health will become the reputable Journal in Vietnam and Asia Pacific. The journal welcomes authors to submit their manuscripts as commentary, original research paper drawn from quantitative or qualitative studies, systematic review and meta-analysis, book review and synthetic report of lessons learned from public health programs. Manuscripts that are of high quality and cover any topics related to public health, in Vietnam and beyond, will be considered for publication. Submission to and publication at VJPH at this stage is free of charge, and any changes will be informed in advanced. Authors wishing to submit their manuscripts should read carefully the following guideline.